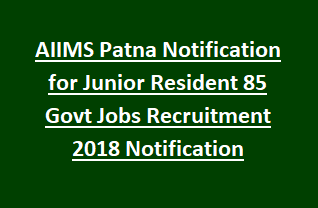 AIIMS Patna Junior Resident recruitment 2018. Eligible candidates are suggested to apply through offline mode for this AIIMS Junior Resident Jobs and application is available in official website of AIIMS Patna @ http://aiimspatna.org. Last date for submission of application form for this AIIMS Junior Resident is on or before 23/01/2018. Candidates will be shortlisted for this Junior Resident Jobs of AIIMS Patna Recruitment is based on Merit in Educational qualification and Interview. For more vacancy details, Age limits, Salary, Selection process and Application process of All India Institute of Medical Sciences AIIMS, Patna Recruitment of Senior resident Jobs notification 2018 are given below. Last date for the receipt of application: 23-01-2018. Pay Scale for the AIIMS Senior Resident is As per the norms. For Non Medical Candidates M.Sc in their in their respective subject. As on 23-01-2018 upper age limit is 33 years for and for SC/ST candidates age relaxation are applicable as per the norms. For SC/ST candidates as per the norms upper age relaxation will be given. For Junior Resident posts a written exam will be conducted for the candidates selection. For attending Written exam candidates must have bring 2 photos and Application form photo copy. For Senior Residents: Selection of candidates applying for Tutor, Assistant, Associate and Additional Professor Jobs in AIIMS Patna Recruitment 2018 will be based on Interview and work Experience. Application fee for general/ OBC category is Rs.1000/- in form of Demand Draft in favour of AIIMS Patna. No application fee for other category. Interested candidates may download the application form from AIIMS Patna Official website and fill all the details and attach the required documents and send the application form to AIIMS Patna to be reachable on or before 23/01/2018..
Click here to Download Application form for AIIMS Patna Jobs Recruitment 2018. Please share this Junior Jobs in AIIMS Patna Recruitment Examination 2018 article to your friends.